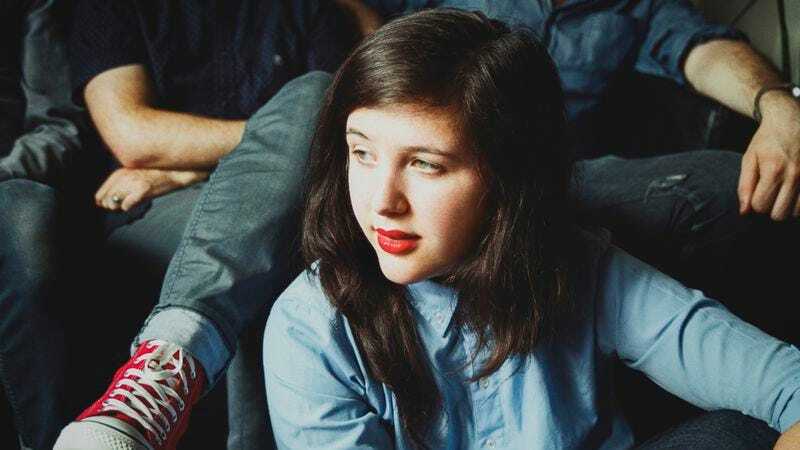 Early this year Richmond, Virginia, songwriter Lucy Dacus released her debut album, No Burden. Originally put out by EggHunt, the record saw so much hype that physical copies soon became hard to come by. On September 9, Matador Records will remedy that by re-releasing No Burden, giving Dacus’ daring debut another loving push into the world. Ahead of the No Burden reissue, The A.V. Club spoke with Dacus about three songs from the album and the personal experiences that inspired their creation. Lucy Dacus: It is a common thing, but the song was written specifically about this one time I was playing solo, which I used to only ever do. Basically, the setup of the place is really tiny, the crowd is two or three feet away from me. And so the person was, like it says in the song, leaned up against the door frame, listening really, really intently when everyone else is kind of doing their bar thing, hanging out. Which is good and fine. But it just really caught me off guard. I couldn’t even remember the lyrics to whatever song I was singing, ’cause this person’s so intently staring. And I think I’ve seen this person around Richmond sometimes, I have an idea of who it might be. But I’m not positive. I think if I was sure, I would go and tell them, “Hey! You don’t even know that this matters to me, but I wrote a song about you,” and just risk how awkward that might be. Because it was really, for some reason, affecting to feel like I was having this personal conversation with somebody. The A.V. Club: Do you think you’ll ever go up to the person you think it is and ask them about it? LD: I think about it all the time because, like I said, I think I know who it is, but I’m not positive. I just have to work up the chutzpah or the confidence to potentially embarrass myself and be told “no” or be told “yes, and I think that’s pretty weird.” Because it is a total stranger. Really, it is weird to write songs about people that you don’t know, ’cause you’re assuming so much about them. But I guess the song is acknowledging that I don’t know this person. AVC: The lyrics mention you feeling short in the exchange. Is that a common feeling you have with people that have a strong connection with your work? LD: I still feel that all the time because—yeah, I’m kind of baring my deepest self and my hardest thoughts to people, and I’m sure that every person in the crowd has their own deep thoughts that would be worth hearing and talking about. Especially in Richmond, I know that so many creative people come out to shows. The community is really stellar, and I’ve gotten to know a couple of those people, but not everybody. And it does feel kind of unfair that I’m taking up everybody’s time with singing my lyrics and my ideas. And I’m short in the exchange. I don’t get to meet as many people. AVC: Do you like people coming up to you after shows and sharing a bit of their lives with you? LD: Yeah, it’s one of my favorite things, meeting people from the towns that we’re playing in and asking, “What do you love about this place?” That’s a huge part of traveling. The problem recently is we’ve been doing so many shows that I’ve lost my voice a couple times so I don’t come out after shows as much, which is horrid because I really like to do that. AVC: Does it feel like a more shared experience, having other musicians playing with you? LD: It does feel more shared, especially since, when I was solo, you don’t really have an option of what you’re looking at as an audience member. It’s definitely all about me, which is nice now, to have other people on the stage to divert people’s attention from staring at me. It’s way more fun to perform with a band. LD: It’s a little more complicated than just what the lyrics are saying. Actually, the song “Dream State…” is the first half of the song—“Dream State…” and “… Familiar Place” are basically one song. And “Dream State…” is about my real life that felt like a dream, and “… Familiar Place” is about a dream that I had that felt like my real life. I used to have, when I was a kid, this recurring dream that I lived in this neighborhood and I was friends with this family and I would go over to their house through their backyard and play with them. And I didn’t have the dream for years, and then I had it a couple years ago. And everyone in the dream had aged and the garden had died. And I went up to the house and all the kids had grown up to seven years older since the last time I had had the dream. They were like, “Where were you?” and referenced the fact that I hadn’t been there in a really long time. I was like, “I’m sorry, I wish I could have come and seen you guys.” And they caught me up on their family history—their father had died and some of them had gotten married, some of them had had their own kids. It felt so real. It felt really familiar and all these people that I guess my brain made up, I cared about them so much. But it wasn’t real at all, actually. I guess. I mean, it’s as real as you acknowledge it to be. AVC: One theory about dreams is that they are preparing you for a similar event to happen in your waking life. Has anything like that occurred? LD: I feel like nothing that specific has happened, but I do maybe have a general fear of missing out on people’s lives that I care about. Even now, specifically, being on tour so much, just worrying I’m not being present as a friend or with my family. And that’s kind of new. When the song was written, I don’t know what I was afraid of, probably something similar, just losing out on being a part of the lives of the people that I care about. AVC: This goes back a bit to “Direct Address” in a way, but does touring make it feel like you have stronger connections with strangers than the people in your personal life? LD: It’s hard because no one can really tell you how to handle those types of relationships—you kind of grow up learning what it means to be a family, you learn kind of how to be a friend, maybe you learn how to be in a relationship. And all those dynamics are overworked in the media and they’re relevant to your life as a kid, but this intense connection to strangers thing—I have no practice in that. I guess the practice is now, doing so many shows. I’m inclined to care very immensely for people that care about me, but the sheer quantity of people even at just one show that I’m not even going to be able to talk to is like—I don’t yet know how to reconcile how to care for those people. And I guess the hope is that the music is kind of like a blanket statement of caring. At least that’s what I would hope. Basically his justification for all of his antics was like, “Why not? This is a crazy ride and we have to ride it in order to live a fulfilling life.” And so, later—like years later—when I was writing the song, it was actually kind of inspired by some conversations I was having with another friend about our mutual friends that were kind of self-destructing and were really unhappy but didn’t really know how to fix it. And as a friend, you think, “Oh, I know exactly how to fix it. I know how I would treat this situation if I were you. I would stop doing these things that are harmful.” But that’s not really helpful to the person that is stuck, and so in writing about these people in my life that were hurting themselves, basically, that quote came back to me. And it’s like, oh well, some people do want to live this way—some people do want to kind of live this raucous life that I don’t really understand. So I kind of have to play the fool and not hyper-manage their lives and love them anyways. AVC: Was it hard to have to resign yourself to the fact that these people would just continue to fall? LD: That you have to let them make the decisions that they’re making? AVC: Yeah, and you’re just kind of along for the ride. LD: Yeah. And that’s the hard position, in other words—that’s the concession that’s being made in the song: I don’t think that you should do this, but it doesn’t really matter what I think. If I want to be your friend, I have to let you do this. Especially if the people don’t want your advice and don’t want change—if you really do love them, you’ll be with them through whatever is hard. I’m not at peace with those friendship dynamics. It’s still really hard every day to watch people you love struggle. But that’s kind of the best you can do, I think, as a friend. Purchase No Burden here and help support The A.V. Club.